I Dare You Articulation is an interactive app for your iPad, iPad mini, iPhone, and iPod touch that features a collection of 600 child-friendly dares designed for speech-language pathologists to use with individuals who exhibit difficulty producing the following speech sounds: S, Z, R, L, S/R/L Blends, SH, CH, and TH. Tons of content: with just a tap of a finger, children and clinicians can uncover 600 child-friendly sound specific dares that are perfect for the speech therapy setting. Hear the dare: each dare has an exciting narrative audio component to it. With over 60 minutes worth of hilarious child-friendly dares to pretend to do, I Dare You Articulation is guaranteed to help unlock your students’ imagination while properly pronouncing their target speech sounds. Simply put, I Dare You Articulation helps unlock students’ imagination while properly pronouncing their target speech sounds. Traditional speech therapy that focuses on improving articulation abilities can usually get stale and boring, but with this application, speech therapy can easily become a game of make-believe instead of a chore. This application encourages students to get out of their seat to attempt to perform various articulation-specific gross motor activities that involve making funny sounds, poses, actions, facial expressions, and so much more. With this unique assortment of child-friendly dares, students are introduced with the opportunity to think about their articulation words from a new angle that emphasizes creative gross motor activity. It is the hope of this speech-language pathologist that by encouraging students to interact with this application, they will be able to achieve fresh perspectives that can lead to fabulous gains toward mastering their speech therapy goals and objectives. The structure of I Dare You Articulation is a departure from traditional articulation drill work and is effective for students ages 6 and up. With this format, clients enjoy sharing child-friendly dares to their friends and classmates outside of the speech therapy room, further practicing their communication skills and thereby facilitating the sometimes difficult stage of carrying over newly-acquired skills. By reviewing the content within I Dare You Articulation with the client, paraprofessionals in the classroom and/or parents at home can reinforce the client’s skills while sharing a fun activity. Practicing communication skills in environments outside the speech therapy setting increases opportunities for generalization of communication skills. 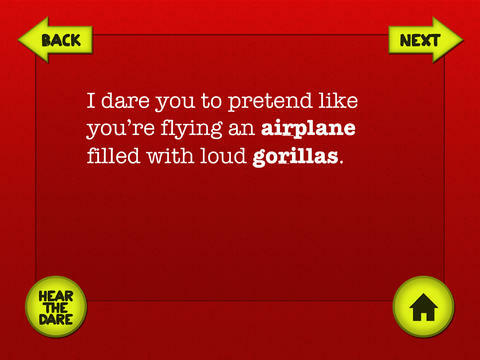 I invite you to use I Dare You Articulation to spice up your speech therapy sessions. The child-friendly dares are intended to provide many opportunities for clients to take risks and practice speaking and acting in a supportive environment. I guarantee that the content within this application will help your students develop positive self-confidence and overcome barriers of shyness and stage fright. Regardless of when, where or how these child-friendly dares are used within the speech therapy session, one thing is certain, children (as well as clinicians) will have a blast giving them a try . . . and in the process, your students will continue to practice the correct pronunciation of their sounds at the spontaneous conversation level. Let your imagination run wild and have fun with this therapy material!